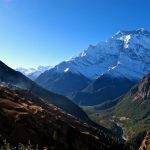 Annapurna region has been declared one of the best trekking destinations in the world by all trekkers – foreign and local- who have experienced any one of the many treks. 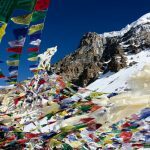 Annapurna circuit trek, in particular, circumvents the Annapurna massif completely in a matter of 21 days. 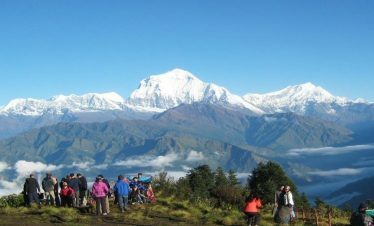 The trek begins from Besisahar and ends at Birethanti, Pokhara after reaching to a maximum elevation of 5416 meters at Thorung la pass. 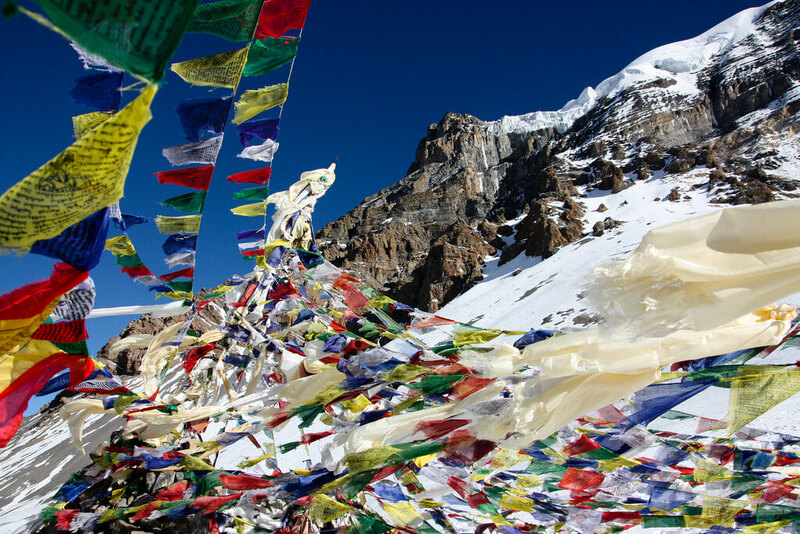 Thorung la pass is the highlight of the trek along with the mountain vistas and the pristine landscape along the trail. The elevations and the tricky, snowy trails pose a challenge which becomes a great feat once you reach the top of the pass and enjoy the surrounding majestic views. As we follow the Marsyangdi River, crossing its clear waters over suspension bridges many times, we go from traditional villages, terraced hills to yak pastures at the bases of mountain peaks. 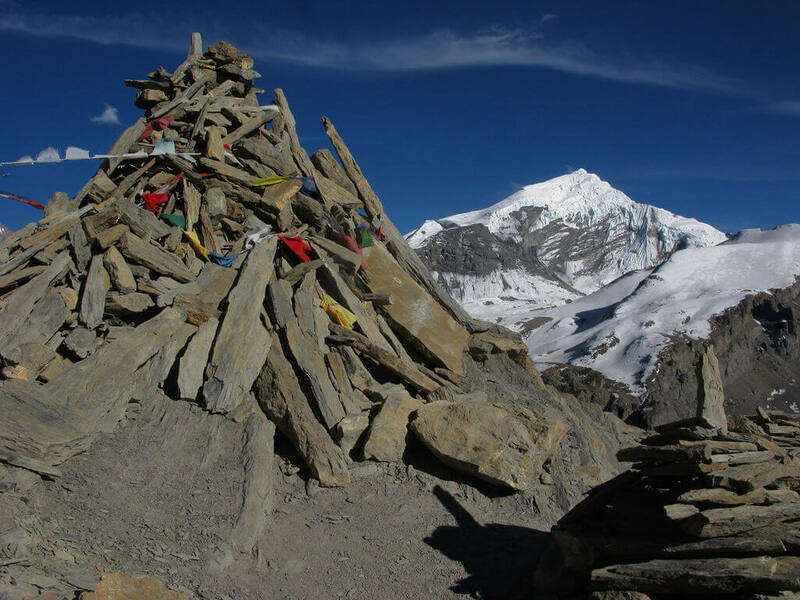 From Tibetan-styled villages, Gompas, a monastery, and sacred Hindu temple- Muktinath, the trek is filled with cultural and religious heritages. In addition to that, the serenity of the trails and the warm hospitality of the people make the trek a truly enriching experience. The Gurung, Thakali and other ethnic villages provide a glimpse into the life of the traditional people living around the majestic mountains. Our trip starts from the capital city, Kathmandu. From here, we can either a take local bus or hire a private jeep to reach Besisahar. The drive is about 6-7 hours long with the views of hills and fields. We spend the night in Besisahar at 830 meters. We can take a bus or a jeep to Bhulbule at 840 meters. After the rocky road, we begin walking towards Bahun danda. We first cross the Marsyangdi River and continue along its right side. 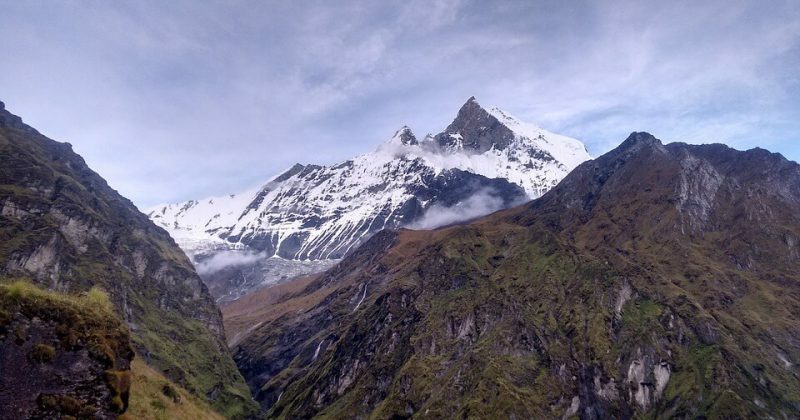 As we travel through terraced fields and forests, we start to get glimpses of the 8000m peaks like Manaslu, Himal chuli, Ngadi chuli and others in the region. After a while, the trail makes a steep climb to finally reach Bahun danda. It is a small, beautiful village named after its inhabitants, the Brahmins. There are few shops and teahouses here where we spend the night at an elevation of 1300 meters. After an early breakfast, we start our day towards Chamje. From Bahun Danda, the trail dips abruptly as we reach Syange at 1080 meters. We cross Marsyangdi River on a suspension bridge and walk along the river. Finally, after a climb, we reach the stone village of Jagat at 1330 meters. 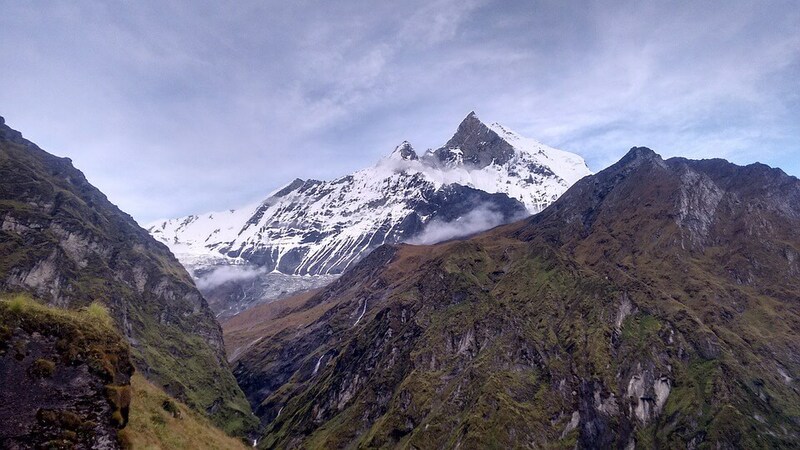 From here, the trail descends, crosses the Ghatte Khola and then climbs again to finally reach Chamje. We spend the night in Chamje at 2160 meters. From Chamje, we pass across narrow valleys among rhododendron, pine, and bamboo forests. As we cross the rocky folds of a mountain, we cross a bridge and then ascend to a wider valley. After crossing the village of Tal, we trek past fields of barley, wheat, and potatoes till we reach Dharapani. Then, we turn west from the pine and fir forests to reach our destination of the day, Bagarchhap, at 2160 meters. From Bagarchhap, we reach a village and then take a steep climb to reach a Tamang village. 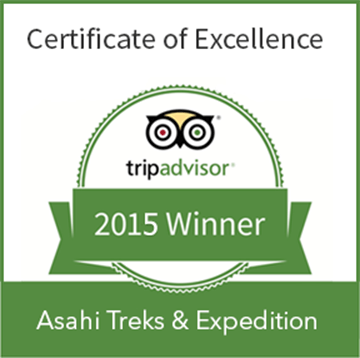 It is a beautiful village with exquisite views of peaks like Manaslu, Lamjung, Annapurna and others. From here we move towards a Tibetan village that separates the lowlands and high hills. As we follow a flat path we pass through Thanchowk, then Kolo and finally reach Chame. 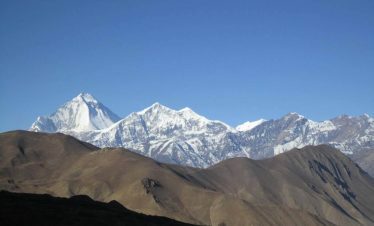 We spend the night here at an elevation of 2710 m.
We start the day from the older part of Chame and climb up to Telekhu. After crossing forests on leveled path we reach Brathang and after a while cross back to the south bank of Marsyangdi river. 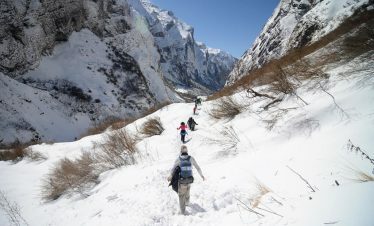 Then we make a climb over a ridge and finally reach Pisang from the upper part of Manang valley. We spend the night in Pisang at 3300 meters. Pisang is the gateway to the upper region of Manang. The trek reaches up to a Tibetan-styled village named Braga. It is a unique scene with the houses stacked upon each other forming balconies with each other’s rooftops. The highlight of the trek is a Gompa, the largest in the village and perched high with beautiful views of the entire village. From here we soon reach Manang and spend the night there at 3540 meters. After crossing the 3000 meter mark on our trip, we take a rest day to acclimatize to the increasing elevation. We need to rest and store enough energy for the thinning oxygen levels ahead. You can choose to rest and enjoy the natural setting of Manang. People also take a short detour to Khangsar village. First, you follow the Khangsar River and cross it over a bridge and ascend for a while to reach Khangsar village. It is a beautiful Tibetan-style village at an elevation of 3700 meters. We return back to Manang to spend the night. 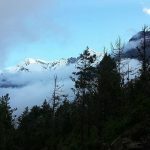 From Manang, we trek slowly towards Thorung la. As we leave the large trees behind, we see vegetation comprising of junipers and small alpine grass. 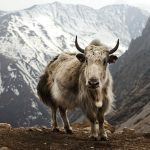 We might also see horses, yaks and blue sheep grazing in the pastures. Letdar is an hour away from the yak pastures. We spend the night here at 4245 meters. From Letdar, we follow the east bank of Jarang Khola to Thorung Phedi. Thorung Phedi is a rock-strewn meadow surrounded by vertical cliffs. 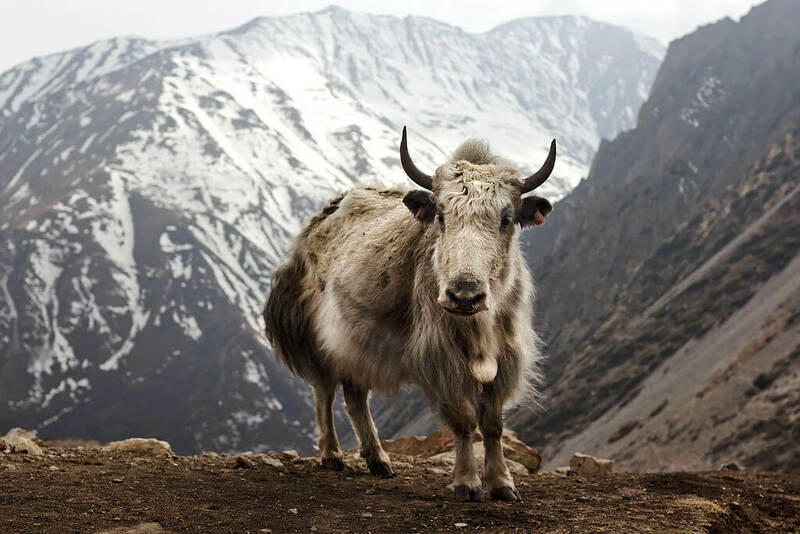 Blue sheep, snow leopard, lammergeyers, and Himalayan griffons are common sightings of this area. We spend the night at an elevation of 4600 meters. 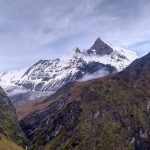 This next day is tough with Thorung la pass being the highest elevation of the trek and the remainder of the trek becomes easier after that. This is the hardest day of the trek as we cross the 5416 meter point at the pass. Heavy snowfall can sometimes block the path which makes the trail more crowded. It takes about 16 hours to complete the day’s journey and get to our destination on time. 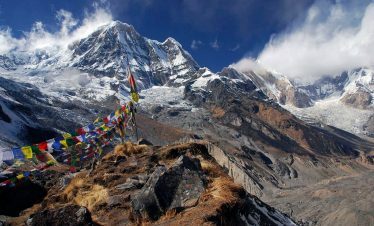 It takes around 4 – 6 hours to reach the pass from Thorung Phedi. The trek is easier without the cold, harsh winds that make the ancient and easy trade route difficult to cross. 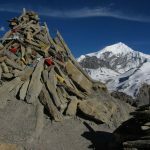 Thorung la pass with its traditional prayer flags and stones is the best viewpoint for mountains like Annapurna, Gangapurna and Khatung kang. After a descent of 1600 meters along with the Dhaulagiri in the distance, we reach grassy fields and meadows to reach our destination – Muktinath. Muktinath is one of the holy sites for Hindus all over the world. Devotees are believed to achieve salvation after visiting the temple. The 108 water sprouts with their holy water, the eternal flame, and a natural spring are the highlights of this sacred Bishnu temple. From Muktinath, we descend through springs, meadows, and trees to Kagbeni. 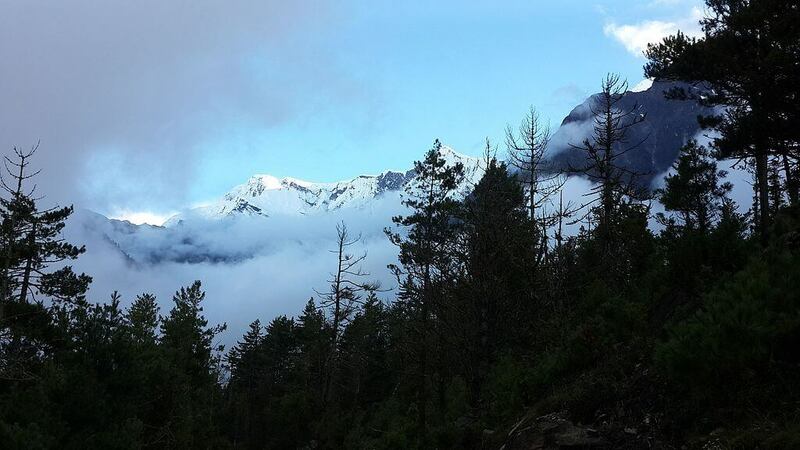 Then, we descend down to Jomsom which is the reverse of Jomson trek trail. As we keep descending we finally reach Jomsom at an elevation of 2713 meters. From Jomson, we again keep descending to first reach Kali Gandaki valley and then further more to reach Marpha. Marpha is famous for its beautiful apple orchards and all apple products ranging from candies to apple brandy. The trek passes through a new trail that passes through Chokhopani, a traditional Thakali village. 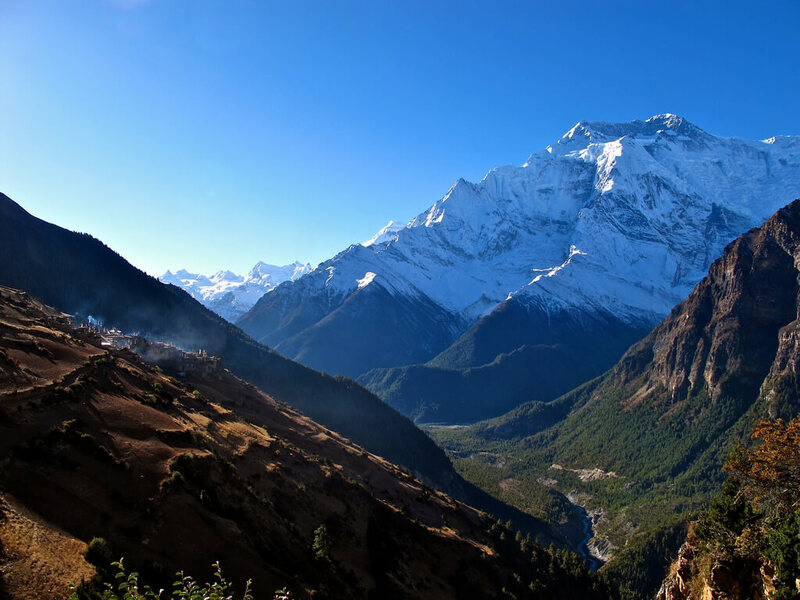 It is known for the beautiful Himalayan vistas that include Nilgiri, Dhaulagiri, Annapurna, Tukuche and many others. After we cross a river and follow a newly constructed road, we reach Kalopani at an elevation of 2530 meters. We descend from Kalopani until we reach a bridge in Ghasa. Then we pass through forests and a popular Ruptse Chhahara (waterfall) till we reach Narchyang Besi. We pass through different villages on this day till we reach Tatopani. Tatopani is a famous tourist spot known for its natural hot spring. Tourists stay here to relax and take a dip in the hot spring to relieve all their exhaustion. We spend the night at an elevation of 1680 meters. We take a rest day in Tatopani to relive the exciting moments of the trek. We can stay dipped in the pool, read books, listen to music or mingle with other tourists from all around the world. People sharing their stories and different adventure experiences is a fun pastime here. 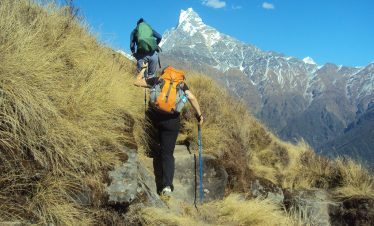 From Tatopani, our trek proceeds to the mid-hills of Nepal as we pass through terraced fields and farmlands. We walk past villages and get to witness rhododendrons and magnolia that are common in the region. We get the glimpses of beautiful Himalayan peaks as we near Ghorepani. Ghorepani is a small Magar village with shops. The local products and the warm hospitality of the people make the stay a memorable one. We spend the night in Ghorepani at an elevation of 2775 meters. From Ghorepani, we pass through meadows, rhododendron forests, and fields and then descend through stone steps to reach Tikhedhunga. After another 3 hours of descent, we reach to Birethanti. We spend the night here at 1039 meters. From Birethanti, we take a taxi to Pokhara at 850 meters via Nayapool. There we enjoy the lakes, temples, caves and other tourist attractions. The viewpoints like World Peace Pagoda and Sarangkot are famous for their magnificent mountain views. The nightlife of the lakeside area is a very relaxing and entertaining experience. This is where your trek officially ends. All your arrival and final departure from airport- Hotel- airport. All ground transportation bus or car as per your need. Porter as per your request. All kinds of Drinks like Tea, Coffee, Mineral water, Beer, Juice, Coke, fanta, other alcoholic hard drinks, ETC. Sweet things like chocolate, Desserts and others. Hot shower and battery charge.